Deputy Foreign Minister Danny Ayalon, displays in a new Hasbara video the magic of Jerusalem as a city that combines diversity with harmony, modernity with history, and as a sacred city that for the first time in history, under Israeli sovereignty, Jews, Christians, Muslims, secular, religious, young and old are living side by side. In addition, the video shows the unbreakable bond between the Jewish people and Jerusalem. 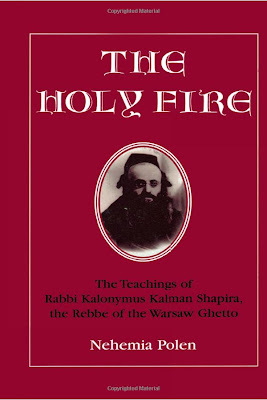 Kalonymus Kalman Shapira (also called the Piaseczner Rebbe) was born in Grodzisk, Poland to his father, the Imrei Elimelech of Grodzhisk. 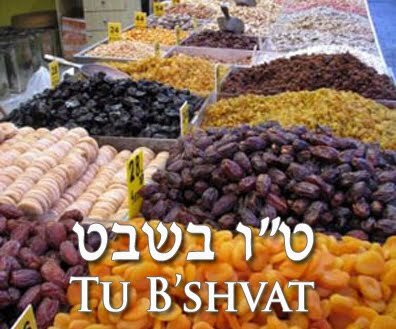 Named after his maternal great-grandfather, the renowned Maor VaShemesh, he was a scion of a distinguished family, which included Rabbi Elimelech of Lizhensk, the Chozeh of Lublin and the Maggid of Kozhnitz. At the age of three, he was orphaned by the death of his father. In 1905 he married Rachel Chaya Miriam, daughter of his nephew Grand Rabbi Yerachmiel Moshe of Kozhnitz. She helped him prepare his lectures and books, even adding pertinent insights of her own. 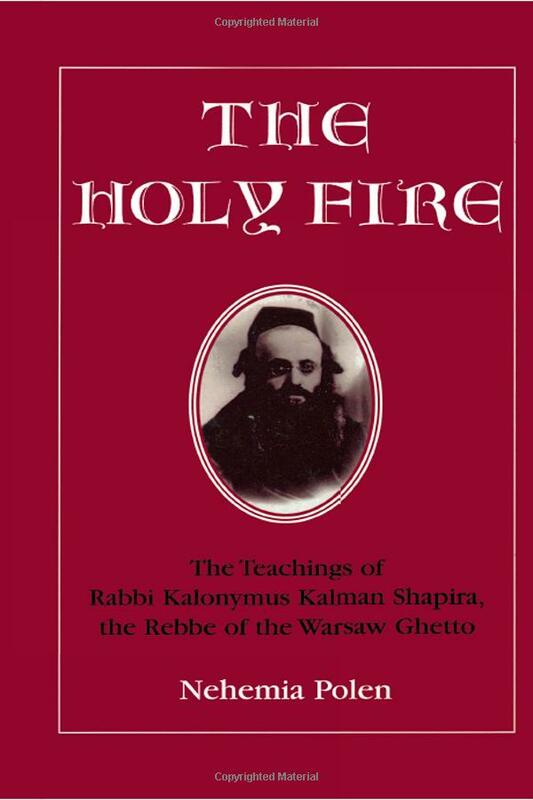 In 1909 he was appointed rabbi of Piaseczno, near Warsaw, and subsequently attracted many chasidim. He was deeply focused on the education of children and young men, establishing the yeshiva Da'as Moshe in 1923. Rabbi Shapira's only son and his son's wife were killed during the Nazi aerial bombing of Warsaw in September, 1939. After the Nazi invasion of Poland, Rabbi Shapira was interned with a few of his chasidim in the Warsaw Ghetto, where he ran a secret synagogue. He wrote a book while in the camp and told some of his students where he buried it (in a canister). Later The students went back and recovered his inspirational speeches of this period from the ruins of the ghetto and published under the title Aish Kodesh. After the Warsaw Ghetto Uprising was crushed in 1943, Rabbi Shapira was taken to the Trevaniki work camp near Lublin. Prisoners who were completely worked out by exhaustion and starvation were removed and sent to the Treblinka extermination camp. 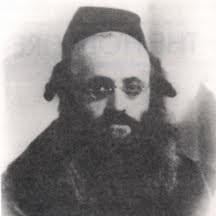 Rabbi Shapira spent his last few months in Treblinka, where he was murdered by the Nazis in 1943. 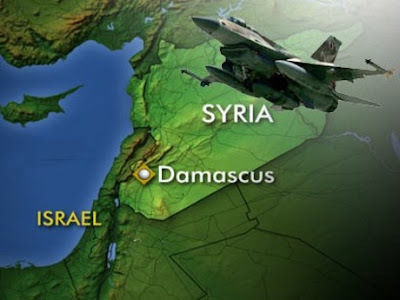 Israëlische gevechtsvliegtuigen hebben woensdag een doelwit bij de Syrisch-Libanese grens aangevallen. Dit hebben westerse diplomaten in Israël gezegd. Ze meldden niet aan welke kant van de grens de aanval werd gepleegd, maar volgens sommige meldingen in de regio was de aanval vlakbij de grens met Libanon in Syrië. Het doelwit zou een konvooi zijn geweest dat wapens vervoerde. De Israëlische strijdkrachten wilden volgens Israëlische media hier niets over kwijt. Het hoofd van de militaire inlichtingendienst, generaal Aviv Kochavi, is naar verluidt dinsdag spoorslags naar Washington gegaan voor overleg met de Amerikanen. Israël is net de VS en veel andere partijen erg bang dat de chemische wapens van het regime van president Bashar al-Assad in Syrië „in verkeerde handen vallen”. Daarmee worden extremistische groepen bedoeld die in Syrië tegen de regering vechten. Het Libanese leger berichtte woensdag dat het aantal schendingen van het luchtruim door Israëlische vliegtuigen sterk is toegenomen in 24 uur tijd. Er waren afgelopen nacht veel Israëlische vliegtuigen boven Libanon en er is een doel geraakt in het grensgebied, vertelde een Libanese zegsman. 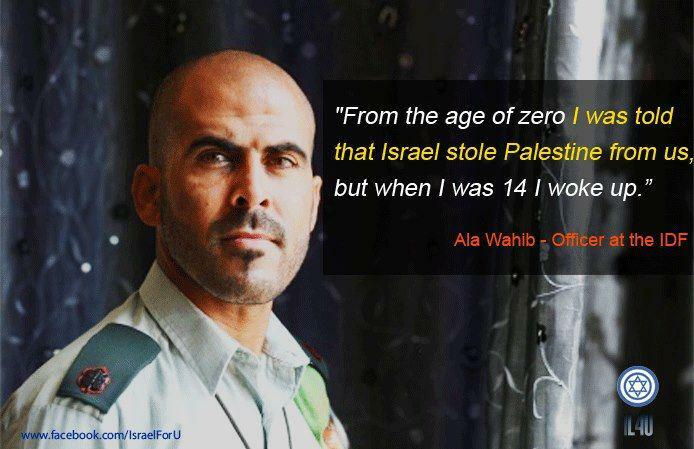 Aaron Katsof grew up in the US and moved to Israel when he was 18. 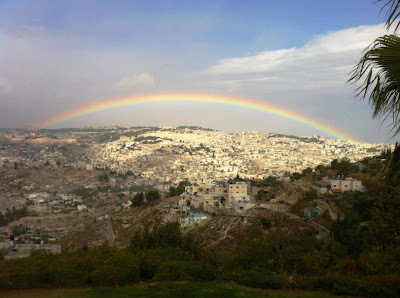 Today he lives in the settlement of Esh Kodesh, a small outpost near the larger settlement of Shiloh, in the Nablus area. Katsof recently built a new house in Esh Kodesh, a permanent structure (as opposed to the trailer homes that house most of the community). Kastsof is active as chief spokesman for the settlement and as part of an organization that captures video footage of Palestinian or IDF violence against settlers. Jan. 5th 2013 -Some 250 Palestinians rioted just outside the village of Esh Kodesh in the Benjamin region of Judea and Samaria. The rioters broke down the fences around the village’s vineyards causing heavy damage. 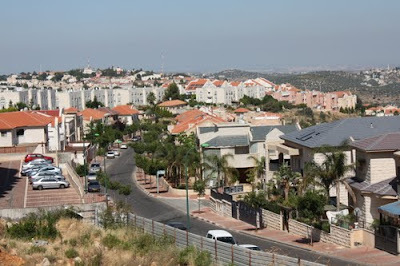 Following the disturbances, about 30 residents arrived from the entire Shilo area to Esh Kodesh, and at first had to push out the Arab rioters with hurdled stones. 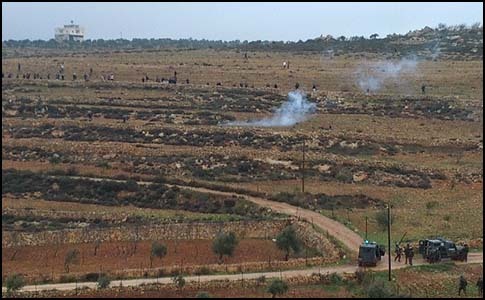 Shortly thereafter, the regional emergency squad was activated by the security forces, and its members fired in the air until the arrival of the IDF and the transfer of management of the incident to the military. Serious damage was caused to several vineyards, after rioters tore down the fences and struck the vines. A security vehicle windshield was smashed by a rock. The Esh Kodesh fence and fields.. Photo: Tazpit. 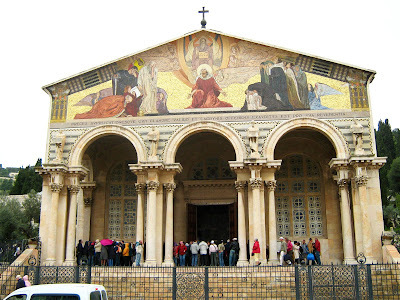 Our Comment: We as Christian-Zionists support Expantions like Esh Kodesh ( Aish Kodesh ) in Judea & Samaria, because they are in line and fulfillment of Gods promises as spoken by the Prophet Ezekiel f.e. Chapter 36 in the Tenach. 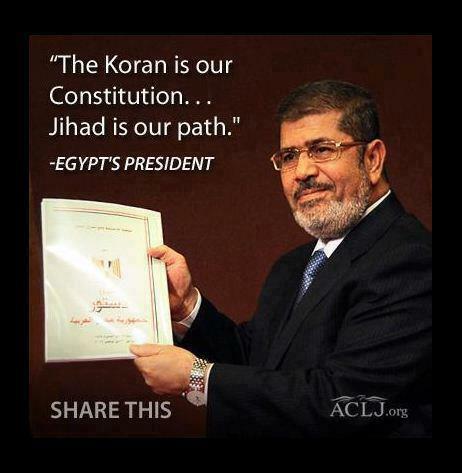 (and the Islam/Arabs who claim to believe in all the prophets of old, should not have any problems with it either). The Temple Institute moved a giant copper laver, or wash basin, to the new home of its exhibit of Temple articles on Monday. A statement by the Temple Institute said the basin, which is 2.5 meters (8.2 feet) tall and 2.8 meters (9.1 foot) in diameter is kosher for use in the Third Temple and can be used to purify 12 priests at once. 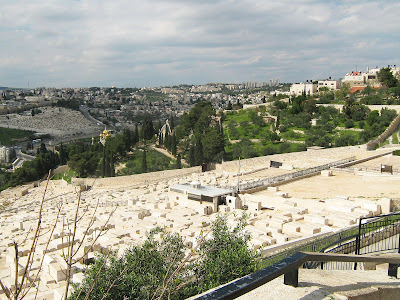 The statement also said the new basin has advanced systems that make it possible to overcome certain problems in Jewish law, as was done at the time of the Second Temple. 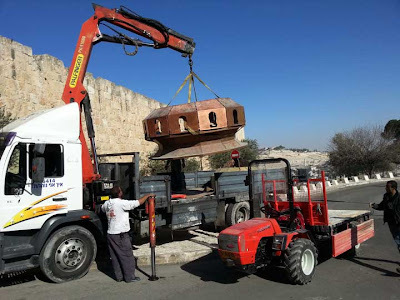 The Temple Organizations HQ congratulated the Temple Institute for its new headquarters and wished its employees "to see their vessels being moved again soon, this time to their appointed place, the Temple…"
The laver, a large vessel which appears like a kettle, was the first vessel which the priests had contact with every day, for they had to sanctify their hands and feet with its waters before commencing any sacred task in the Holy Temple. 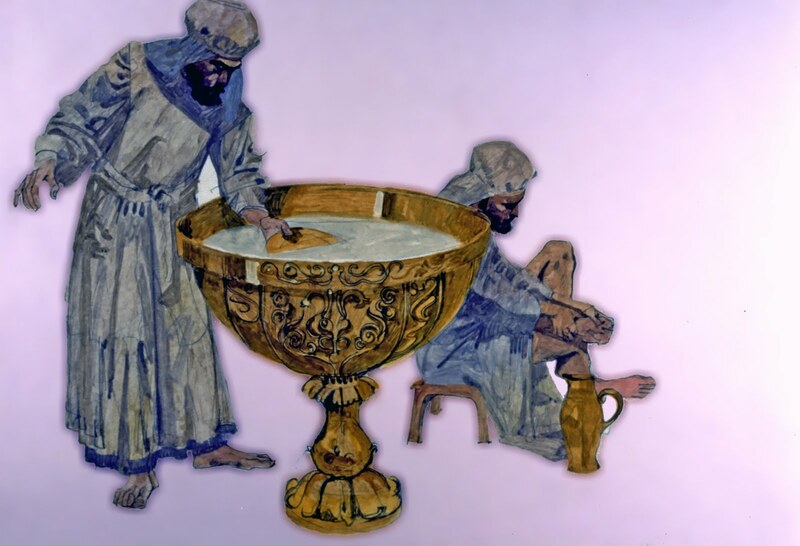 The original laver which was constructed for the desert tabernacle in Moses' time included two spigots for releasing the water. In the era of the Second Temple, the High Priest Ben Katin fashioned 12 faucets for the laver, so that the entire shift who participate in the offering of the daily sacrifice may sanctify themselves at once. 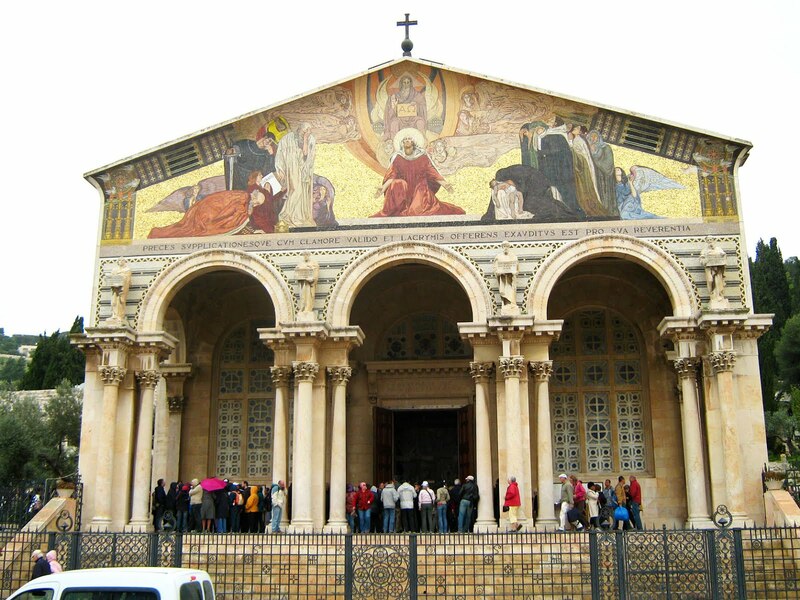 The Laver, second station in the Temple, was used by the priests of old for ceremonial washing before entering the Holy Place. Een dansende Mirjam, een huilende Jeremia, Aaron als hogepriester in het heiligdom en David die met een slinger in zijn hand naar de reus Goliath gaat. 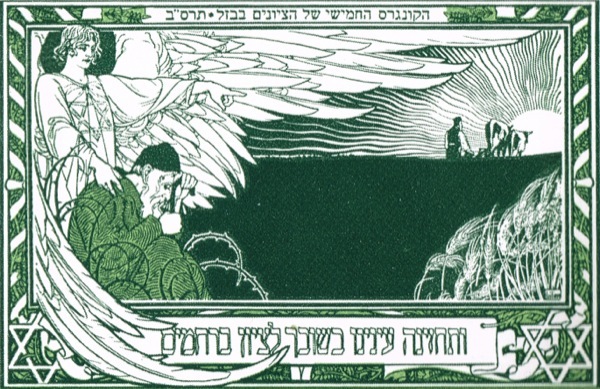 Het is een bont gezelschap van geloofshelden die zijn getekend in Jugendstil door de Joodse kunstenaar Ephraïm Moshe Lilien. Lilien was ëën van de belangrijkste boekillustratoren uit het begin van de vorige eeuw en oprichter van de kunstacademie Bezalel in Jeruzalem. De teksten bij de tekeningen zijn in ik-vorm. De geloofshelden spreken en geven daardoor samen met de tekeningen vol symboliek een krachtig beeld, dat de lezer inspireert om zich te verdiepen in de geschiedenis van deze helden in de Bijbel. In het boek is een uitgebreide levensbeschrijving opgenomen van Lilien met citaten uit zijn brieven en in totaal 38 schitterende tekeningen en kopergravures. Een team van hersenspecialisten heeft tijdens een test hersenactiviteit kunnen vaststellen bij de voormalige premier Ariël Sharon. Andere onderzoeken naar de bewustzijnstoestand lgaven helaas niet zulke goede resultaten. De artsen zijn er daarom niet zeker van, of hij de informatie bewust kan waarnemen of niet. Toch is volgens de artsen de positief verlopen stimulatietest een teken van hoop. 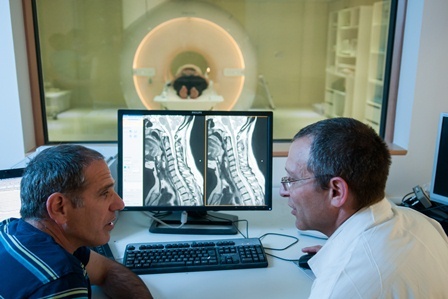 Op de foto staan de artsen van het Soroka Hospital in Be'er Sheva die Sharon onderzochten, links prof Alon Friedman en rechts dr. Ilan Shelef, voor een kernspintomograaf. 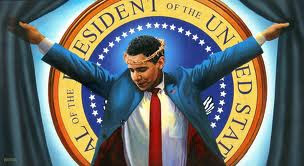 Jonathan Cahn Addresses The Presidential Inaugural Prayer Breakfast 21 january 2013. As Bro. Jonathan was addressing. at that meeting there were congressman, Senators, Ambassadors, etc. It looks like Rabbi Cahn had the opportunity and the (naive) invitation for that prayer-breakfast before O's 2nd inauguration. I guess no one had a slightest idear what he was going to speak about. I suspect Cahn knew he was going as a sheep among wolves, but he took the decision to do this, maybe even without informing his Ministry Church. It is a harsh (in Gods Love though) endtime preaching against sin and call to repentance, not only for America but for the whole world. Those who endorsed the Truth cheered Amen, but I suspect there was a lot of gnashing of teeth also at that meeting, and those who immediatly started the enemies work, including legal action against it (which they are good in, in the U.S.). This cartoon published in The Sunday Times (subscription-only) would be offensive at the best of times. That it has appeared on Holocaust Memorial Day is doubly so. A hideous looking PM Benjamin Netanyahu caricature builds a wall cemented with blood, crushing Palestinians including women and children. 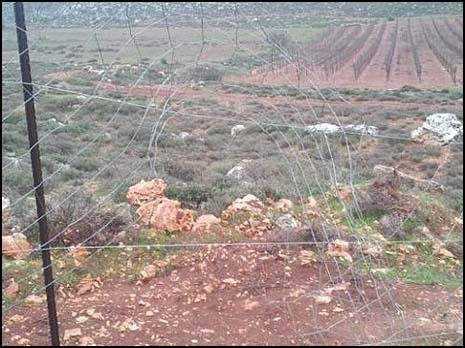 Israel’s security barrier (of which the vast majority is a fence and not a wall) is meant to protect Israeli civilians against Palestinian terrorism. In any case, the imagery of this cartoon amounts to a blood libel on a day when the millions of victims of the Holocaust are remembered. "In conversation with a friend of mine recently, I was asked, “Do you think in 200 years time, people will have forgotten the Holocaust, or believe that it was a myth?” I naively responded, “No. I believe there are enough good people in the world to ensure that doesn’t happen.” At the time, I would never have thought the editors of the Sunday Times were in amongst those who would seek, in true Der Sturmer fashion, to use Holocaust Memorial Day to publish a blood libel, and knowingly undermine the memory of one of the worst genocides ever." 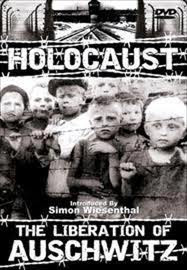 "Holocaust Memorial Day is an opportunity to remember the most appalling atrocities carried out in modern history. It should also be a day when the media remembers that Israel’s actions to defend its citizens bear no relation whatsoever to the genocidal crimes of the Nazis. On any day, this cartoon’s imagery is an assault on the real victims of genocide, demeans their suffering and insults their memory. The Sunday Times should be mindful that what started as cartoons in the 1930′s ultimately led to violence and unspeakable tragedy. This is a lesson that The Sunday Times has clearly not absorbed." How could The Sunday Times stoop so low? Bij het Spiegelmonument 'Nooit Meer Auschwitz' is de jaarlijkse Holocaust-herdenking gehouden. 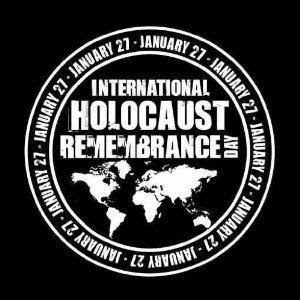 Vandaag is het International Holocaust Memorial Day. Op 27 januari 1945 werd het vernietigingskamp Auschwitz in Polen bevrijd door het Rode Leger. De bijeenkomst in Amsterdam begon met een stille tocht naar het Spiegelmonument 'Nooit Meer Auschwitz' in het Wertheimpark. Daar zijn kransen gelegd en toespraken gehouden door burgemeester Van der Laan, voorzitter Jacques Grishaver van het Nederlands Auschwitz Comité en Menno Lavino namens de jongeren. Rabbijn Menno ter Brink sprak joodse rouwgebeden uit en Sinti en Roma maakten muziek. 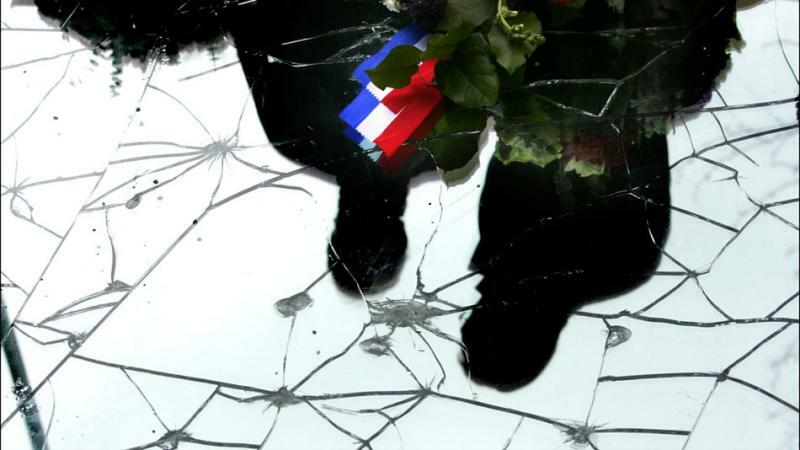 Bij de herdenking waren ook de voorzitters van de Eerste en Tweede Kamer, staatssecretaris Van Rijn van VWS, leden van de Tweede Kamer en ambassadeurs en vertegenwoordigers van verschillende landen aanwezig. De Joden en zigeuners die tijdens de Tweede Wereldoorlog door de nazi's zijn omgebracht, worden over de hele wereld jaarlijks herdacht op of rond 27 januari, International Holocaust Memorial Day. In Europa werden in de jaren 1941-1945 6 miljoen Joden vermoord, van wie 1 miljoen in Auschwitz. In het Zaans Museum heeft Geertje Pel-Groot uit Zaandam postuum de onderscheiding 'Rechtvaardige onder de Volken' gekregen van het holocaustinstituut Yad Vashem in Jeruzalem. Ook haar dochter Trijnie Pfann-Pel (89) kreeg deze onderscheiding. De twee vrouwen redden in 1944 het leven van de joodse baby Marion Swaab, die bij hen was ondergebracht. Geertje werd opgepakt en vergast in concentratiekamp Ravensbrück. Today, on International Holocaust Remembrance Day, we remember the millions of Jews and other victims of the Nazi regime who were imprisoned, enslaved and murdered for their race and religion. 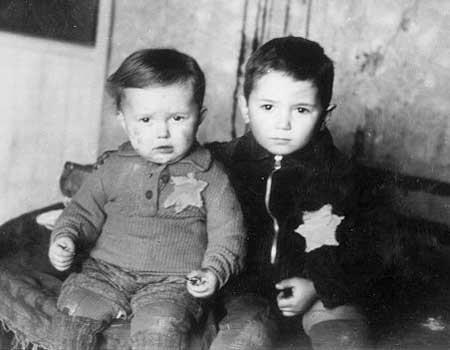 During the Holocaust, more than 6 million Jews were murdered, including many, many innocent Jewish children. Het gebouw van de Messiaanse gemeente van Kiryat Gat, in zuidelijk Israël, is eerder deze maand uitgebrand nadat een onbekend gebleven persoon een brandbom door het raam gooide. 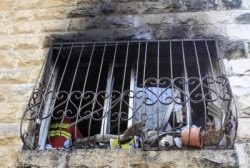 'Enkele weken geleden is onze gemeente in Kiryat Gat uitgebrand. Het was de enige gemeente in de stad, met een grote visie voor de toekomst, betrokken bij de hulp aan veel mensen. Onze invloed in de stad heeft blijkbaar bij sommigen geleid tot 'bezorgdheid', en zij hebben besloten ons werk te stoppen door het gebouw in brand te steken. Het gebeurde op een avond na een dienst, dat iemand een benzinebom ('Molotovcocktail') door een raam gooide en alles vlam vatte. 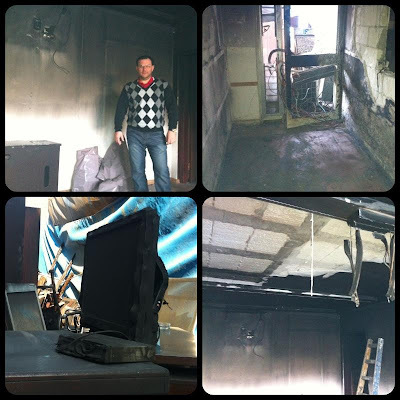 Brandstichting is een misdrijf, dus uiteraard heeft niemand er de verantwoordelijkheid voor genomen. De verhuurder van het gebouw heeft echter goede connecties in Kiryat Gat en is er in geslaagd na te gaan wie hiervoor verantwoordelijk kan zijn. Het was duidelijk dat deze aanval op ons een religieus karakter heeft. 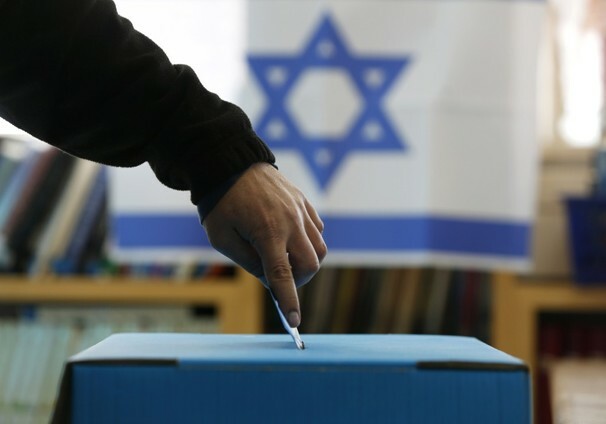 Dit was de enige zaal voor onze gemeente in Kiryat Gat; we hebben nu geen plaats meer voor ontmoeting en gebed. Niet alleen het gebouw is beschadigd, ook de muziekinstallatie binnen is vernield. De verhuurde is een goede vriend, hij is bereid de reparatiekosten te betalen en het eigen risico komt voor onze rekening'. 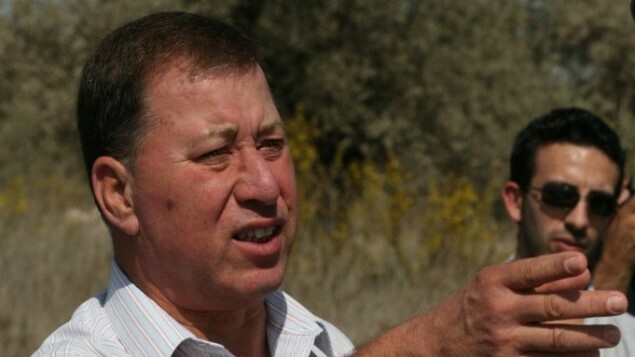 Ron Nachman, de eerste en tot nu toe enige burgemeester van Ariël in centraal Samaria, is vrijdag overleden na een lange strijd tegen kanker. Hij is 70 jaar geworden. Nachman werd eind jaren 1970 bekend, toen hij tien jaar na de Zesdaagse Oorlog gehoor gaf aan de oproep van de toenmalige regering van de Arbeidspartij om zich te vestigen in de Bijbelse gebieden Judea en Samaria. Nachman leidde een groep vastbesloten pioniers die een tentenkamp oprichtten op een stategische heuveltop met uitzicht op Israëls kwetsbare kustvlakte.Jaren later, in 1985, vormde de nederzetting Ariël zijn eerste lokale bestuur, waarin Nachman als leider werd gekozen. In 1992 werd Nachman voor Likoed in de Knesset gekozen, maar hij gaf die zetel drie jaar later op toe besloten werd dat politici niet gelijktijdig lid van de Knesset en burgemeester konden zijn. 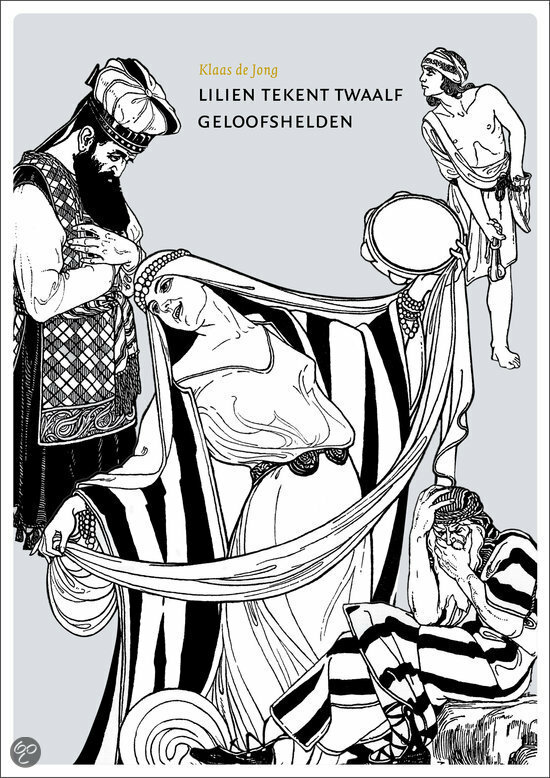 Nachman's toewijding aan Ariël was onwankelbaar, en geldt vandaag als een voorbeeld, niet alleen van Israëlische innovatie en vooruitgang, maar ook als een symbool van co-existentie tussen Joden en Arabieren in deze betwiste gebieden. Veel Arabieren in het gebied winkelen en werken in Ariël, en de gerealiseerde universiteit telt een flink aantal Palestijnse studenten. Nachman was ook zeer populair bij de Christelijke vrienden van Israël, omdat hij vanuit de Bijbel begreep waarom Joden zoals hijzelf terugkeerden en zich vestigden op de heuvels van Samaria. Veel Christelijke groepen bezochten Ariël tijdens hun reis door het Heilige Land, en Nachman heeft velen van hen persoonlijk verwelkomd en ontvangen. 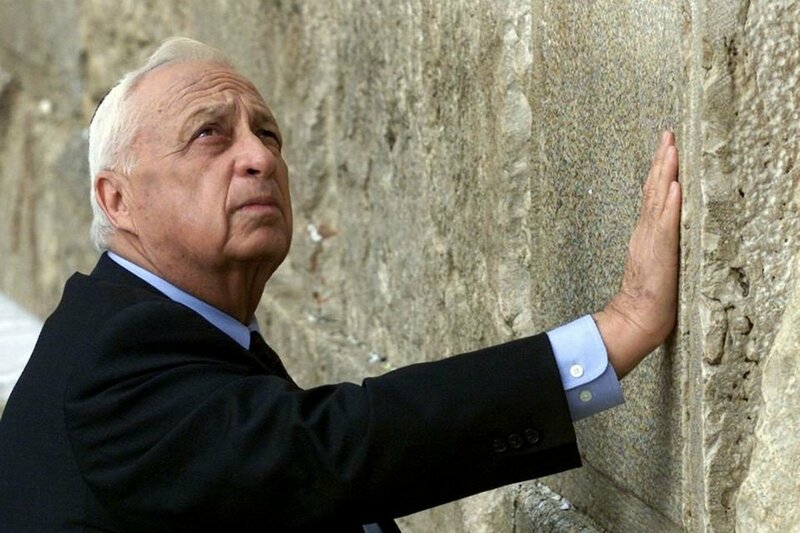 Premier Benjamin Netanyahu zei zondag bij de begrafenis van Nachman 'Ik heb een dierbare vriend verloren. 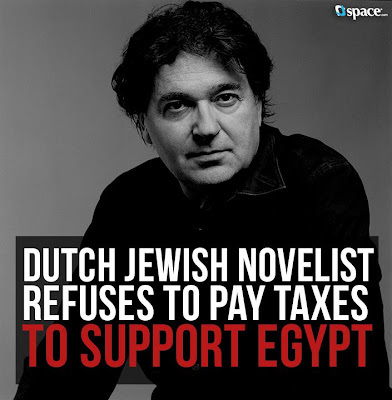 Ron was een grote zionistische patriot Ik hield heel veel van hem'.Veel Israëli's en misschien wel miljoenen Christenen over de hele wereld voelen hetzelfde als de premier van Israël over het verlies van Ron Nachman. Deze DVD box bevat 6 DVD's met 10 documentaires over Israël, met films over de moderne Staat Israël en haar leiders, over Jeruzalem en het Heilige Land, geschiedenis en religie, Christendom en Joodse mystiek en de actuele serie over het leger van Israël. Documentaire filmer Willy Lindwer is nationaal en internationaal bekend geworden door zijn films over Israël en de Holocaust. Hij heeft een omvangrijk en veelzijdig oeuvre opgebouwd dat klassiek en tijdloos is. Het is een ‘monument in film’ van een bijzonder tijdperk. Zijn films zijn nooit vrijblijvend. Zij dwingen de kijker de feiten en de verhalen serieus te nemen. 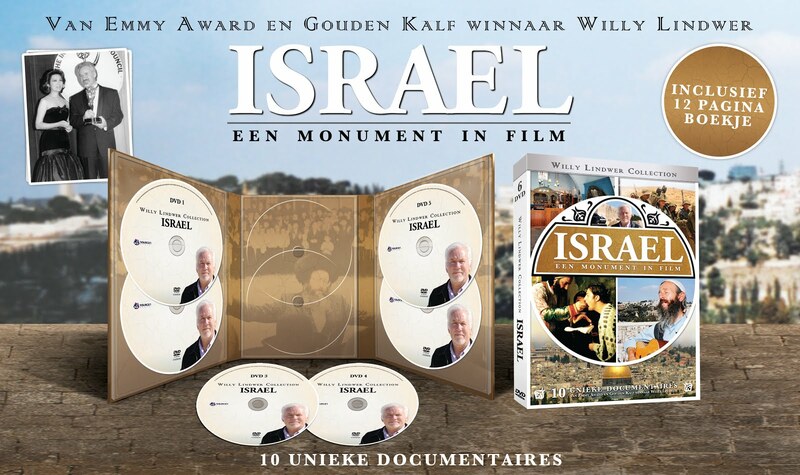 Deze unieke DVD box met het gebundelde filmwerk van Willy Lindwer is een nieuwe dimensie die toegevoegd wordt aan zijn rijke oeuvre. De films zijn nu voor het eerst verzameld. Als een rode draad loopt door zijn oeuvre de niet aflatende ijver om te willen vertellen over Israel en van de massamoord op de Joden tijdens de Tweede Wereldoorlog. Vele documentaires heeft hij daaraan gewijd en zijn halsstarrigheid om door middel van ‘oral history’ getuigenissen te willen vastleggen wordt alom geprezen. Op 18 maart 2013 presenteert Source 1 Media in De Hollandsche Schouwburg een DVD-box met daarop 17 documentaires over de Jodenvervolging van filmmaker Willy Lindwer. 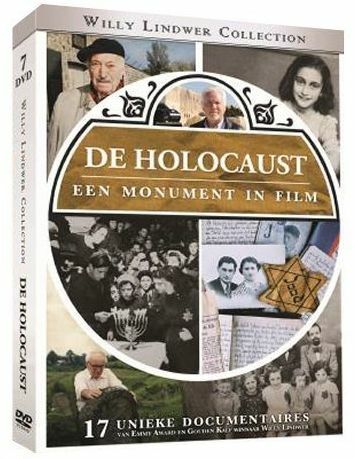 In de DVD‐box zijn 17 van Willy Lindwer ’s belangrijkste documentaires opgenomen over de 2e Wereldoorlog en de Jodenvervolging in Nederland, met onder meer films over: Anne Frank, Westerbork, Joodse Oorlogspleegkinderen, Het Fatale Dilemma over de Joodsche Raad van Amsterdam, Holland, Vaarwel!, Simon Wiesenthal, het Ghetto van Warschau, de Wannsee Conferentie en In Memoriam: Herinnering aan een vermoord Kind n.a.v. het boek en de tentoonstelling over de 18.000 vermoorde Nederlandse Joodse kinderen tijdens de oorlog. "And the king shall do according to his will; and he shall exalt himself, and magnify himself above every god, and shall speak marvellous things against the God of gods, and shall prosper till the indignation be accomplished: for that that is determined shall be done. Neither shall he regard the God of his fathers, nor the desire of women, nor regard any god: for he shall magnify himself above all." "Thou believest that there is one God; thou doest well: the devils also believe, and tremble." Stop het geven van ons bezuinigingsgeld aan de antisemitische Moslim-Broederschap regering in Egypte, via de EU en ons Ministerie van Buitenlandse Zaken. Dat Frans Timmermans, de huidige Minister van Buitenlandse zaken, miljoenen van ons bezuinigingsgeld, m.b.t. een EU-pakket van 5 miljard, aan Egypte wil gaan geven. Dit geld is zogenaamd al door onze vorige regering toegezegd, en het kan altijd gestopt worden, beweert de Minister. Egypte wordt geregeerd door de antisemitische ondemocratische moslim-broederschap, die Joden uitmaakt voor bloedzuigers, apen en varkens. Israel en de Joden moeten weg. 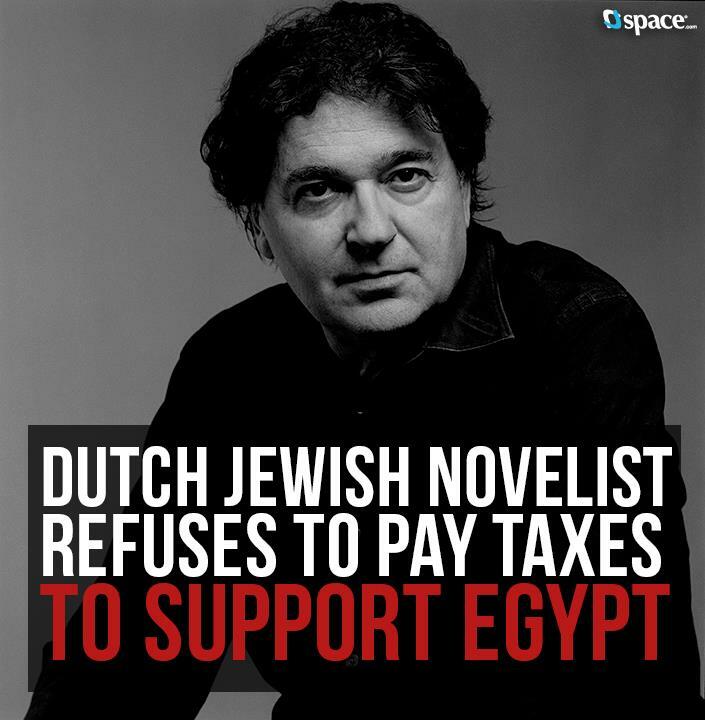 Eenvoudig het stoppen van het doorsluizen van ons geld, wat wij keihard kunnen gebruiken voor de zorg, gehandicapten, ouderen, etc., naar de bodemloze put Egypte, waarvan wij verklaren dat de hoop op een 'democratiseringsproces' via een islamitische, antisemitische regering, een utopie en oxymoron is van de hoogste klasse. Wij verzoeken de Minister Timmermans, en de 2de Kamer, via deze petitie, om onmiddelijke stopzetting van deze uitgave! Photo's by us, March 2010. Ps. We are not so into catholic 'holy' places, but ok.
De Europese Unie werkt met een aantal Arabische landen samen bij het opstellen van een gedetailleerd plan om in maart het vastgelopen vredesproces tussen Israël en de Palestijnen vlot te trekken. Het plan komt er op neer dat de Palestijnen grotendeels hun zin krijgen en dat de Joodse staat feitelijk een vredesverdrag zal worden opgelegd. Het plan is gebaseerd op Palestijnse eisen waar volgens de Oslo akkoorden eigenlijk met Israël onderhandeld over zou moeten worden, zoals de 'grenzen van 1967' en Oost (en de facto ook Noord en Zuid) Jeruzalem als hoofdstad van Palestina. Het plan zal waarschijnlijk na de vorming van een nieuwe Israëlische regering worden gepresenteerd, vermoedelijk in maart. Vervolgens moet Israël akkoord gaan met een nieuwe bevriezing van de bouw van nederzettingen in Judea en Samaria (de Westelijke Jordaanoever).Tevens komt er een duidelijk tijdsplan om in de loop van 2013 een akkoord te bereiken over alle kernpunten. Het plan is een initiatief van Groot Brittannië en Frankrijk en wordt gesteund door Duitsland. De Hoge EU afgevaardigde voor Buitenlandse Zaken Catherine Ashton onderzoekt of het plan als een alomvattend Europees voorstel kan worden gelanceerd. Dat gebeurde onder andere in de Jordaanse hoofdstad Amman, tijdens een bijeenkomst van het Kwartet voor het Midden Oosten. 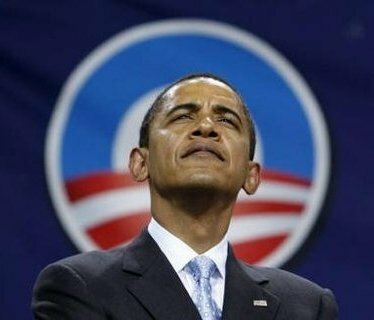 Amerika zou hebben aangegeven te willen wachten met het bespreken van het plan tot na de inauguratie van Barack Obama. 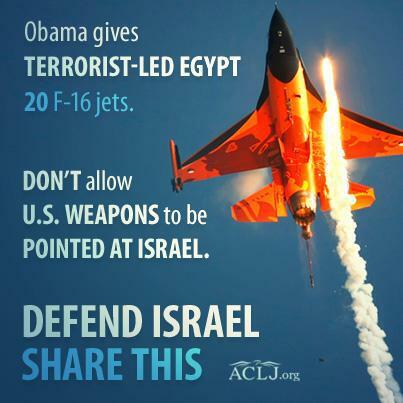 Ons eenvoudig commentaar: Wereld, Poten af van Israel en van Jeruzalem! De Westbank (Judea en Samaria) en Gaza behoren geheel bij Israel. Niet onderhandelbaar, klaar uit! "Aldus luidt het woord van de HERE, die de hemel uitspant en de aarde grondvest, en de geest des mensen in diens binnenste formeert. Zie, Ik maak Jeruzalem tot een schaal der bedwelming voor alle volken in het rond; ja ook tegen Juda [Israel] zal het gaan bij de belegering van Jeruzalem. Te dien dage zal Ik Jeruzalem maken tot een steen, die alle natiën [landen] moeten heffen; allen die hem heffen, zullen zich deerlijk verwonden. En alle volkeren der aarde zullen zich daarheen verzamelen." 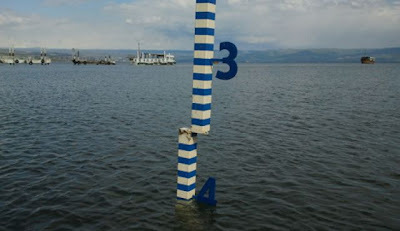 Lake Kinneret enjoyed a robust six-day period resulting in a massive rise of nearly a meter, the Water Authority said. 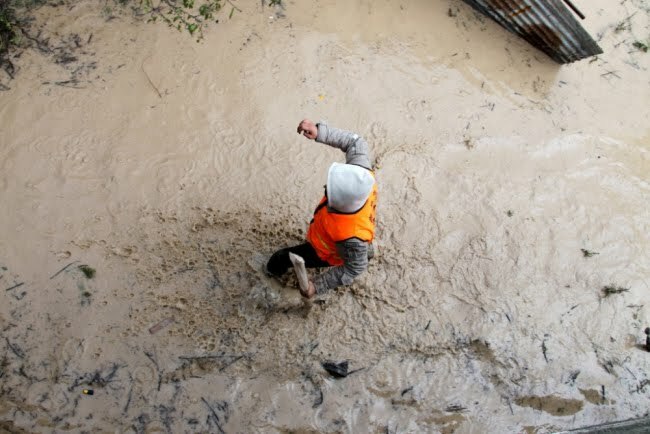 The weather system which brought a week-long rain storm to Israel has caused increased outflow in the rivers flowing to the lake, which is Israel's only freshwater reservoir, resulting in an 80cm rise in water levels in the span of five days. 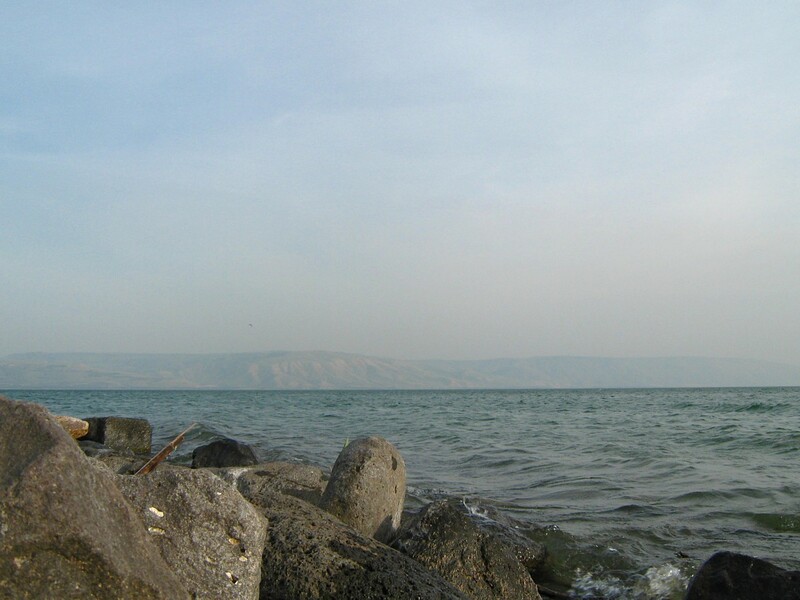 The Sea of Galilee has added 2 meters since the winter began and is now at 211.20 meters below sea level. The Kinneret's water level is now 1.80 meters above its lower red line and 2.40 meters below its upper red line – the highest level recorded since 2007. According to the Water Authority, the recent snowfall is expected to add an additional 50cm to the lake – not taking into consideration future rainfall this season. 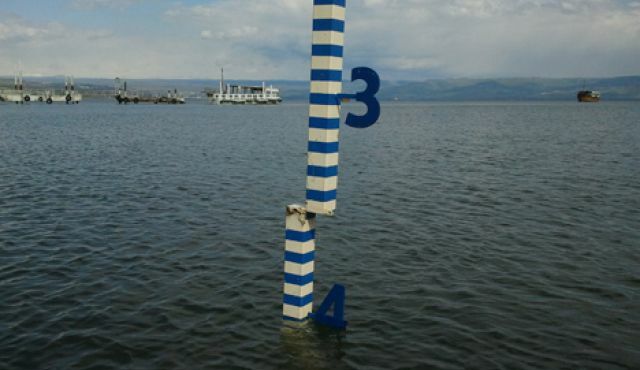 According to the water authority, the amount of water added to Lake Kinneret in January alone make up two-thirds of the lake's annual average. 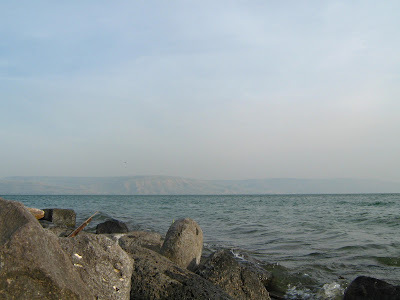 Photo made by us in March 2010, of the Sea of Galilee, also known as Lake Kinneret or Lake Tiberias, at extreme Low water-level. 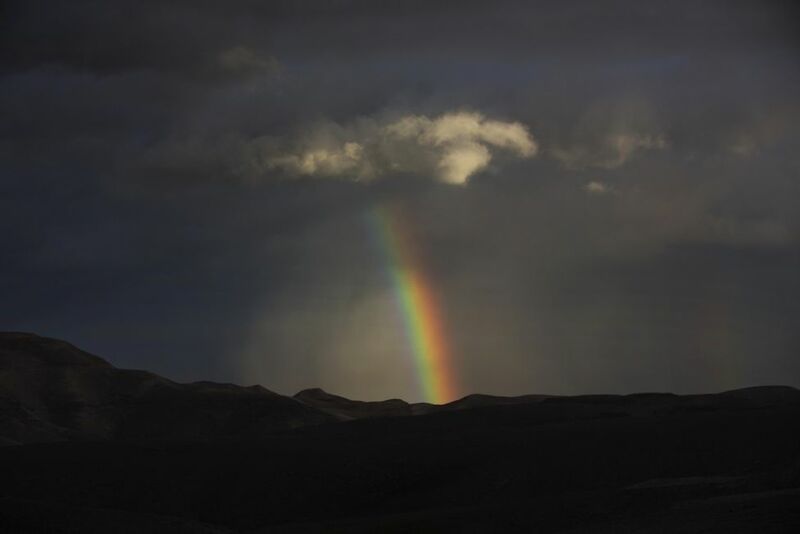 The Rainbow is a Sign of Gods Faithfulness! 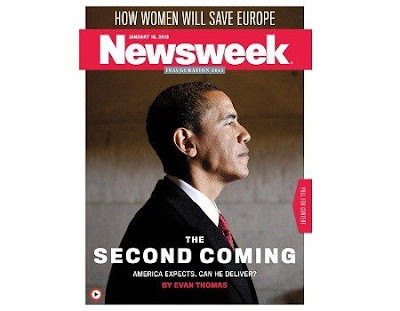 THE LORD YESHUA HA'MASHIACH IS COMING SOON! Afgelopen week, toen een deel van Israël werd overspoeld door een ongewoon sterke winterstorm, moesten veel mensen worden gered uit auto's die vast kwamen te zitten in de waterstromen. Israëlische militairen hielpen, zonder naar het ras te kijken. Een van deze reddingen is de moeite van het vermelden waard. De overstromingen maakten vele kleine wegen in Judea en Samaria (de Westbank) onbruikbaar, en een Palestijns Arabische familie kwam nabij Nablus vast te zitten in hun voertuigen toen een normaal droge rivier op een avond buiten haar oevers trad. De coördinator van het Israëlische leger voor het gebied stuurde kapitein Adiya Hazani er heen, die verantwoordelijk is voor het gebied van Jenin en Tulkarim. Hazani en zijn manschappen gingen er heen en troffen er 200 tot 300 toeschouwers aan en zes of meer personen die met drie auto's vast zaten. Hazani vertelde de legerwoordvoerder dat de situatie nijpend was, maar met de uitstekende hulp van een plaatselijke boer en zijn trekker kon de kapitein elk voertuig bereiken en ieder die gevangen zat naar een veilige plek brengen, voordat het water verder steeg. Toen hem werd gevraagd hoe hij het vond deel te nemen van mensen die als Israëls vijanden worden beschouwd zei kapitein Hazani 'Onze rol in dit gebied is niet gemakkelijk. Geloof me als ik zeg dat we in een ingewikkelde situatie zitten met de Palestijnen. Maar tenslotte zijn we allemaal mensen. De commandant van onze regionale brigade heeft de personen onder zijn bevel herhaaldelijk op het hart gedrukt, dat het helpen van de Palestijnse burgerbevolking een essentieel deel is van onze rol als IDF-soldaten in dit gebied'. Het is frustrerend dat het (goede) gedrag en de visie van kapitein Hazani typerend zijn voor Israëlische officieren en soldaten, maar de gewone internationale pers schrijft er zelden over. In plaats daarvan richten de media zich liever op ongegronde beschuldigingen van Israëls tegenstanders of het handjevol incidenten waarbij Israëlische soldaten inderdaad worden betrapt op slecht gedrag, om op die manier de Joodse Staat een zeer negatief imago te bezorgen. Eerste Messiaans Joodse synagoge gevonden? 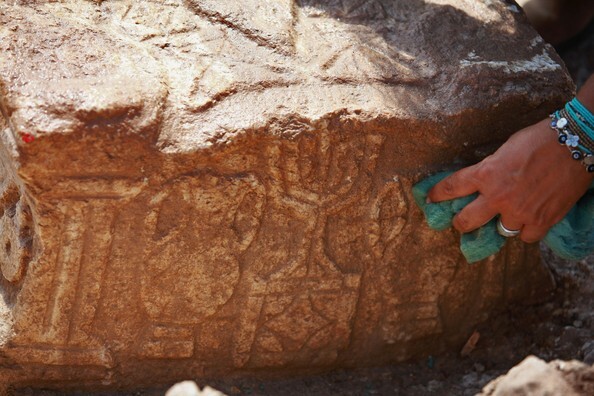 Een team van archeologen van Israel Antiques Authority heeft in Galilea een oude synagoge opgegraven, waarvan de kenmerken doen vermoeden dat deze gebruikt werd door een groep 'buitenstaanders', mogelijk Joodse Christenen. 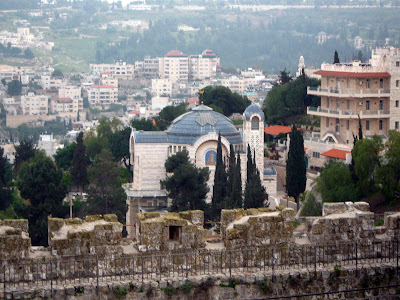 De synagoge werd gevonden in Migdal, een dorpje in Galilea aan de oever van het Meer van Galilea, dat in het Nieuwe Testament bekend is als Magdala en dat bezocht werd door Jezus en zijn discipelen. In Jezus' dagen was Magdala een bloeiend vissersdorp en de woonplaats van veel van zijn volgelingen, met name Maria Magdalena (letterlijk: Maria van Magdala). Volgens de Evangeliën heeft Jezus veel tijd in het dorp doorgebracht. De opgegraven synagoge is verbazend goed bewaard gebleven, en aanzienlijk meer versierd dan veel andere synagogen uit de eerste eeuw die in het gebied werden gevonden. Archeoloog Dina Gorni vertelde aan The Global Mail dat de vondst 'een soort wonder was. We groeven hier alleen als voorzorgsmaatregel voordat een bouwproject zou beginnen'. Toen de synagoge in 2009 voor het eerst werd ontdekt vonden Gorni en haar team een grote stenen tafel of altaar met ingewikkeld beeldhouwwerk. Sindsdien hebben ze de gehele synagoge blootgelegd. Wat de synagoge uniek maakt is de plaatsing, de grootte en hoe hij was versierd. Gorni wees er op, dat de synagoge aan de rand lag van wat toen de stadsgrenzen van Magdala waren. Anderen wezen er op de kleine synagoge slechts ongeveer 120 mensen kon bevatten, terwijl Magdala in die tijd enkele duizenden inwoners telde. 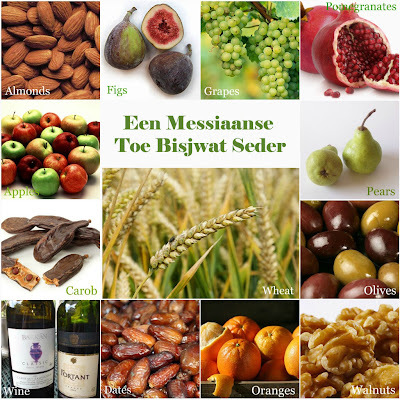 De synagoge was ook kostbaar versierd, zoals met de gebeeldhouwde altaartafel. Dit alle betekent waarschijnlijk dat de synagoge aan een kleine groep 'buitenstaanders' behoorde, die grote waarde hechtte aan het leven als geestelijke gemeenschap. 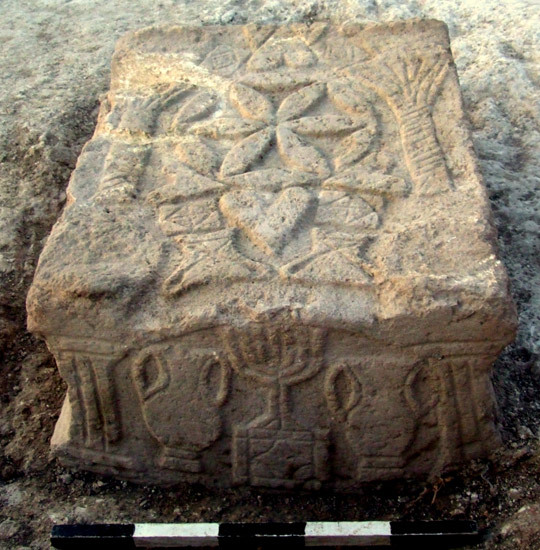 Gorni en andere Israëlische archeologen richten zich vooral op het feit dat deze synagoge bijna zeker in gebruik was in de periode van de Tweede Tempel in Jeruzalem. Bovenstaande gegevens, samen met de ligging in Magdala, maken het waarschijnlijk dat de synagoge een van de eerste gevestigde Messiaans-Joodse plaatsen van aanbidding was. We wijzen er op dat dit speculatief is en deskundigen deze relatie onder veel voorbehoud leggen, maar Gorni en anderen zijn er bijna zeker van dat Jezus in deze synagoge heeft onderwezen. 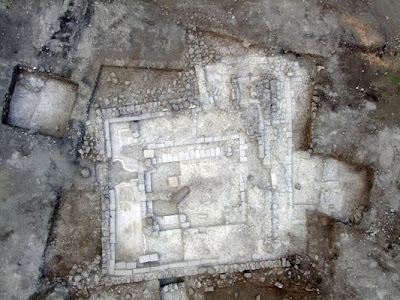 Read: First Messianic Jewish synagogue found? Our comment: And the so called islamic ' palestinian's keep saying and lying there was no Jewish presence and history in their so called 'palestine', while the facts and proofs comes out of the ground daily in Israel. 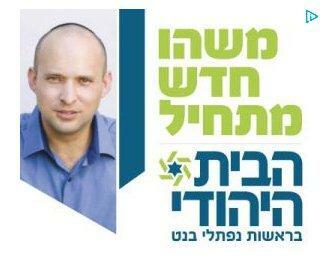 Palestinians lies over Israel: Who provokes who?